A Weaving Experience at Loomsong with Kala. I've always wanted to learn to weave. I had the opportunity to try a table top one time. That led me to purchase a rigid heddle loom and take a class. 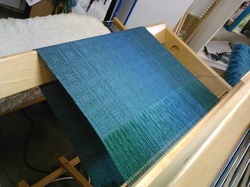 Then Kala offered me an opportunity to weave on her Baby Wolf floor loom in her studio. I was very new to weaving and excited to learn. Kala took me under her wing and showed me not only her passion for weaving and her great sense of color, but taught me all aspects of weaving my first project on a floor loom. We selected a weaving project, a weave structure and material. I learned to prepare the warp, put the warp onto the loom, thread the heddles and sleigh the reed and complete the set up to weave. She let me do the work and was right there to assist and lend a hand. Being in her studio was great fun as well with a lot of side learning as we chatted. I finished my first project and am very happy with it. What can I say, I hooked! Kala teaches classes at the Weaver's Guild of MN and private lessons at Studio 248. Whether you're new to weaving or simply want to improve your skills check the schedule below or Contact Loomsong for a private lesson and learn something new.